Terra is the final part of Hubert Essakow’s trilogy based on the three elements of water, fire and earth. First came Flow, then Ignis and now Terra. I didn’t see Flow but in Ignis Essakow used the analogy of human passion to explore the element, and fire also made a dramatic appearance on stage. In Terra the analogy with earth is that of the human footprint but the element of earth does not appear on stage. 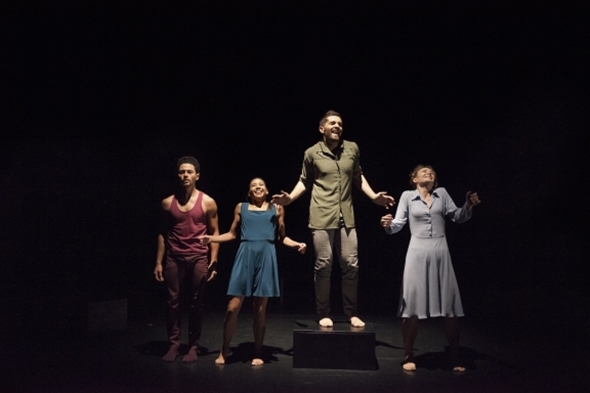 In the handsome program for Terra are three performance photographs by Zadoc Nava of Estela Merlos, Luke Crook and Benjamin Warbis dancing on sand; the link with earth is immediate, but for some reason the concept has not been carried into the production. 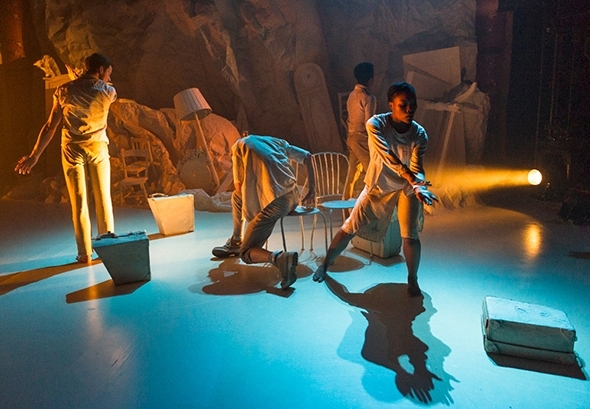 After a stunning opening solo by Merlos as the romantic, half-naked spirit of Mother Earth, four chalky white dancers climb onto the cramped white stage with their white rhomboid suitcases, to begin Earth’s population. They look as if they are artists from a travelling mime circus who have lost their way. The contrast with Mother Earth couldn’t be greater, but paradoxically it is she who is out of place in Terra. The set, by Sofie Lachaert & Luc D’Hanis, is a paper cliff at the foot of which furniture thrown down from the top has come to rest: chairs, a table, a wardrobe, a lamp, a broken mirror. Everything is whitewashed, abstracted and drained of any hint of earth. The set instead belongs to an artistic concept for which Terra seems ill adapted. Lachaert and D’Hanis are designers who have ‘built together an intriguing oeuvre of objects, furniture and site-specific installations, in which they interrogate the boundaries between fine art, craft and design.’ That might work well in the Hayward Gallery but not here. Martina Trottman’s costumes are clearly influenced by Lachaert and D’Hanis so two of the principle theatrical elements in Terra take it in a different direction, one suspects, from that conceived by the choreographer. Militating against the shift is a poem by Ben Okri who was commissioned to write it for Terra. It is rich in allusions and allegories of Earth and we hear the sonorous voice of Okri reading passages from it through the work. Introduced initially over Merlos’s solo with sound designer Gareth Mitchell’s soft rumbling of falling rocks, Terra thus begins in harmony before the seismic conceptual shift takes over. The four dancers (Crook, Warbis, Rob Bridger and Monique Jonas) gather cautiously on the shore, a confluence of strangers despite their similar appearance and identical suitcases. There is a little mistrust in their exploration of each other, a testing of boundaries and balance, as Merlos, now costumed similarly, tries to make them feel at home. Jean-Michel Bernard’s score is redolent of Debussy, airy and playful, while Mitchell’s growling sounds suggest weight and danger. When the men rejoin, the stage is swirling in movement but without a clear idea of where it is going until it resolves in a line at the front of the stage. The cast leaves except for Merlos and Booth, the ‘spirit made flesh’ and the promise of a future. There is the rumbling sound again, and Merlos looks at the girl, performs a kind of benediction and retreats. At a post-show talk with Marc Brew at the Lilian Baylis just two days before, Dame Evelyn Glennie had spoken of the nature of collaborations as being intrinically unstable; you just don’t know if it’s going to work until the collaboration is complete. With Terra Essakow staked his success on a raft of collaborators, some of whom understood his concept and others who just supplied their own. Perhaps that is, after all, an apt, if unintended comment on the current state of the Earth.